Journalism and Social Media Musings | Contemplations and postulations from a 30-something editor. This month marks my fourth anniversary as the social media manager at Nevada Magazine. In February 2009, I created Nevada Magazine’s Facebook account, and since I have delved into Twitter, Google+, LinkedIn, and YouTube — what I consider to be the social media giants — as well as photo-sharing sites and apps such as Flickr, Pinterest, and Instagram. For good measure, I’ve also immersed myself in the blogging forums of Blogger, WordPress, and tumblr. Below I’ll share some dos and don’ts that I’ve learned from these various channels, and then conclude with my 10 Social Media Truths. 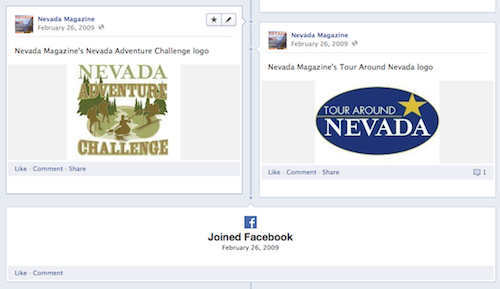 Nevada Magazine’s social media beginnings: February 26, 2009. Do consider the quality of your likes, rather than the quantity. At the time of this blog, we have a comfy 4,900 likes on our Nevada Magazine page, but we know these are legitimate likes because we haven’t used gimmicks such as contests to grow them. These people are genuinely interested in our product and the State of Nevada. Don’t become too comfortable sharing images. It might be satisfying to watch a beautiful photo receive hundreds of likes, but was the message of value? I’d rather know that 10 people “like” a nevadamagazine.com story (and more than likely clicked through to read it), which gets us that much closer to an ROI, in comparison to a beautiful landscape photo generating a plethora of likes without those likers taking away much value. To blend the two concepts, I try to complement image posts with a related story to drive people to our website. Also, don’t underestimate the value of Facebook Groups. Our Nevada Photographers group, with more than 550 members, has granted us access to more talented Nevada freelance photographers that we ever knew existed. Do take advantage of Twitter’s access to conversations happening about your area of interest. For example, I’ve saved a search for the keywords “Nevada Magazine.” This helps me find people who are talking about our magazine, or related subjects (such as other magazines in Nevada). I’ve also saved the hashtag #nevada so that I can readily jump into Twitter conversations happening about our state. If you can provide useful advice — in our case about traveling Nevada — it can lead to business opportunities down the road. If nothing else, you leave a positive taste in the consumer’s mouth. Also, do tag other Twitter users whenever possible. Let them know you’re talking about them; they’ll likely remember you and return the favor down the line. Don’t be afraid to Retweet. While it can tempting to use the “RT” or “MT” designation to change someone’s message and customize it, you want people to know when they come to your profile that you’re not just about yourself. There’s a certain beauty to how others convey their message in 140 characters or less. Do join Google+ if you haven’t yet. So many people seem hesitant to, but it might be the best social media decision your business makes in the long run. A recent Global Web Index study showed Google+ grew to 343 million users worldwide in December 2012, overtaking Twitter to claim the No. 2 spot behind Facebook. “If your business or employer is not already on Google+, it’s time to make the move,” says Alex Hinojosa, Vice President of Media Operations at EMSI Public Relations. Unlike Facebook, you can search keywords, which is a major “plus.” A simple search of “Nevada,” for instance, yields a veritable Google gold mine. And do take advantage of Google Hangouts where applicable. I participate in a weekly Hangout with KRNV News 4 of Reno, during which I talk about weekend events people should be aware of in Northern Nevada. This is great exposure for our magazine, and we’re promoting tourism at the same time. Don’t be overly concerned with +1s, Comments, and the conversational aspect of G+. That will come in time. The reason businesses gravitate back to Facebook, I surmise, is that they have an established, active community there. They get instant gratification from posts in the form of Comments and Likes. G+ doesn’t provide the same social results, at least not for Nevada Magazine, but our presence is strong in the Google realm because of our consistent G+ activity. If businesses (and personal brands, for that matter) establish themselves on Google+ now, as more people jump over to G+, they’ll be there waiting for them. Also, don’t underestimate the value of Google Communities. Our Nevada Photographers community is gaining steam, and larger communities such as California & Western US Landscapes offer yet another venue for us to join the Nevada conversation. Do try to have a presence on YouTube. It’s the second-largest search engine next to Google and can lead people back to your business even if your strength is not video making. While I’ve traveled around the state, I’ve taken footage on my Flip or iPhone to produce amateur videos such as “Nevada Ghost Towns.” The video was recently used on a UK website called Mail Online in a story titled “The ghost towns of Nevada…” This helped the Nevada Ghost Towns video to be the most-viewed video on Nevada Magazine’s channel so far in 2013 (the video also has nearly 3,500 all-time views). That’s worldwide exposure for our magazine that would not have happened had we not had a presence on YouTube. Remember to always put your website and other relevant contact info at the end of your videos. Don’t upload videos for the sake of uploading videos. Video can hurt your reputation just as much as help it. The downside to video is that it takes time and patience, but if you can come up with an effective use of Google Hangouts, remember that you can live stream those and upload them to your YouTube page. Do take LinkedIn company pages seriously. What’s advantageous about LinkedIn is that it’s a business site, so the people using it have business on the mind. This can’t be said for the other major social sites. Be sure to showcase your Products on your company page and get quality Recommendations for them. I approached people who I thought would write a positive recommendation for our 2013 Nevada Historical Calendar. When they did, I sent them a complimentary calendar. Furthermore, we were able to use them as testimonials on our website. Don’t forget to “View page insights” every now and again. Here, you can see the types of business professionals who are following you, the types of industries they represent, where they work, etc. For instance, I know that nearly 75 percent of our 100+ followers work in the Reno region, so I know Reno-related information and stories will be well received. Do invest time in Pinterest if you offer a highly visual product. A restaurant that wants to showcase its food is a great example. A clothing company is another obvious example. As a tourism magazine, I’ve put emphasis on our food & drink stories — a department we call Cravings — by creating a board of the same name. We’re also known for our great landscape and history photos, which have garnered good response on Pinterest. A great advantage we have on Pinterest is that we can link back to our content-heavy site in hopes that we receive a click-through from someone wanting to learn more about the subject. Pay attention to who’s pinning and re-pinning your photos; that gives us insight into possible advertisers, freelancers, subscribers, etc. Don’t pin for the sake of pinning; the same concept that applies to posting videos on YouTube. If it’s not quality and doesn’t have a purpose behind it, don’t pin it. Don’t expect to make sense of Pinterest’s cluttered homepage, either. Do consider Flickr if you have a visually compelling company that can take advantage of original pictorial content. For instance, we’re a tourism magazine, so we post photos from our Nevada travels here. It’s an added benefit to Nevada enthusiasts that they don’t get in print; they get to see 15 or 20 photos, far more than we can make room for in print. Flickr can be advantageous in generating click-throughs as well. I put links to stories on nevadamagazine.com that relate to our Sets and Collections on Flickr. I like the implementation of Groups on Flickr, which brings together users who share specific interests. “Nevada Travel” and “Nevada Ghost Towns” are two of the many Groups of which I’m a member. Don’t judge Flickr too harshly, given its not-so-fortuitous connection to Yahoo!, which has yet to figure out social media. Flickr has been as good a driver of traffic to our site as Pinterest. Do realize how important hashtags are on this popular photo-sharing app. Reno Instagrammer Brian Ball does a great job of explaining the importance of hashtags here. I’ve found it helpful to monitor the hashtag #Nevada. By liking Nevada photos, I’ve been able to increase our followers steadily. I’m also excited that our unique hashtag of #nvmag has gained a decent following. This gives us valuable insight into the type of people who like to travel the state and document those travels on Instagram. And do think about the advantage of Instagram’s connectability to Facebook, Twitter, Flickr, tumblr, and Foursquare. You can get a lot of mileage out of one post, especially if you’re in a hurry and need to get a message out across multiple channels quickly. Don’t post too much. Post only once or twice a day, even if it’s on your personal profile. There’s no bigger turnoff on Instagram than a Home feed congested by the same user. This applies to the big dogs as well. I love National Geographic, but they post way too much on Instagram. Do research tumblr to see how it can benefit your business. I look at it like a social media jack of all trades. It’s a little-bit blog and little-bit Instagram all rolled into one. I also like how it integrates with Twitter. Remember how Instagram posts once looked so great on Twitter, until the two companies had a falling out? Well, I’ve noticed that tumblr image posts actually look great on Twitter (users can view the photo right there on Twitter, as opposed to having to click on a link). Don’t forget to follow other people who share your interests. They’ll likely follow you back. I use Blogger for business and WordPress for personal. I like Blogger’s Google connection, and how it integrates with Google+, YouTube, and Google’s other features. For design and content-management purposes, I prefer WordPress. But you can’t really go wrong with either as long as you have great content. Be sure to activate the social share features so people can easily share your content via their channels. I’ve found that the key to social media is not only promoting yourself, but promoting others at the same time while paying special attention to people’s questions and comments. You have to be there to respond if someone has an inquiry, and the more immediate the better. Consumers are no longer a patient bunch; they want answers now. There is time for social media. If someone in your business or organization says there isn’t, they aren’t the right person for the job, and they’re not recognizing social media’s value. Have a strategy and a refined social media mission. We want to establish ourselves as experts on Nevada travel and history, building trust among our subscribers and potential subscribers. Facebook is still king, at least for now. It has accounted for nearly 75 percent of visits to our website via social referral since 2009. Don’t overestimate Twitter. I think its value has been inflated. I love it, but there’s so much information streaming on it, your message might not be heard with the volume that you think it is. Don’t underestimate Google+. Its relationship to Google search is most important now, but I’m willing to bet that your friends and associates who are looking for a richer social media experience than can be found on Facebook are going to start migrating over in droves this year. Don’t underestimate LinkedIn. Since LinkedIn made its company pages more social in 2012, we’ve seen pretty good click-through numbers already, nearly doubling Google+ in that respect. Pay special attention to analytics, and adapt. StumbleUpon is the sixth-highest driver of traffic to our website among social networks. We don’t have a presence there, but this tells us we perhaps should. Have a consistent brand across all social media. For our profile pictures, we always use our current magazine cover. For our cover photos, we always use a beautiful Nevada landscape photo accompanied by the words “Explore Nevada With Us.” You’ll also notice that our Twitter and YouTube background images match. Make it easy for people to share your content by implementing social share buttons on your website, and also make it easy for people to follow you on their favorite social media. Our Current Issue page has links to all our social pages. The social media landscape changes drastically. Remember MySpace? Remember LiveJournal? You never know when the next big thing is going to come along, so try to catch that wave when it comes. Even before it arrives. What social media outlets have you found to be most successful for your business? Why? 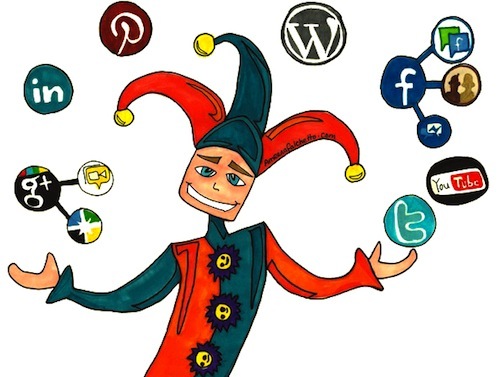 What are your social media truths? Do you agree with mine? Disagree? Please share your thoughts in the comment section. Jay Baer presents at the 2012 IRMA Conference in Scottsdale. Marketing has changed significantly in the last five years or so because it no longer revolves around a one-way channel of communication. Customers are now asking questions constantly in the public realm, especially via social media. They’re constantly posting and tweeting, looking for answers. It’s imperative for companies — according to Baer — to address those questions and offer solutions. He used the Twitter example of @HiltonSuggests. In their Twitter profile description, it states: “Exploring a new city & looking for insider tips? We’re here to help!” As an official Twitter account of the Hilton HHonors program, it obviously behooves them to offer advice to travelers, who might then stay at a Hilton property in the future if they aren’t in the first place. Top of Mind Awareness — In 1977, the top TV show in America had a 30% rating. In 2011, the top TV show in America had a 12% rating. Consumers are, well, consumed with options these days. So this type of awareness is dwindling in our highly fractured media landscape. Frame of Mind Awareness — Also known as inbound marketing, this is the idea that when the customer is ready, they’ll find you, based on content and information you own that already exists. As Baer says, this does not create demand, it fulfills it. Friend of Mind Awareness — Personal and commercial relationships are changing. A company can earn a consumer’s trust by being a valuable resource. When the customer is ready to buy, they don’t have to seek you out. You’re already there, much like a friend. The three types of awareness are explained in more detail on Baer’s company blog at convinceandconvert.com. In that same blog, Baer speaks highly of Geek Squad, which has hundreds of instructional videos on its YouTube channel. At our conference, he focused on River Pools, which found a niche in the pool and spa industry by offering a useful series of blogs that helped boost business even in a down economy. In the regional magazine sector, he pointed out Cottage Life’s online Q&A function and Arizona Highways’ hiking reviews and guides. These businesses have found exceptional and innovative ways to be YOUtilities. One phrase that stuck with me from Baer’s presentation was, “Content is fire. Social media is gasoline.” Baer stressed the importance of content, saying to use social media first and foremost to promote content. To request slides from Baer’s IRMA presentation, go here. Other helpful websites he mentioned were socialhabit.com and zeromomentoftruth.com, the latter from Google concerning the online decision-making moment. As the editor of Nevada Magazine, I was happy to hear Baer’s emphasis on content because we (and other magazines) have plenty of it. However, my experience has shown that people tend to comment/react more to an intriguing image than they do a link to a story. I’ve tried to combine the two by posting a photo that relates to a story, then providing a link if our followers want to read more about the subject. Fans seem more likely to share an image as well with their respective networks. As far as being a YOUtility goes, Nevada Magazine’s stories in and of themselves help tourists planning a Nevada vacation and residents of Nevada who plan to travel within the state. I’ve received numerous letters in my five years as editor in which readers/subscribers talk about how our magazine helps them (or urges them) to plan Nevada trips. The key is to extend this YOUtility factor to social media. This is where I feel like Google+ and Twitter are more advantageous to businesses because you can more successfully search keywords and phrases, which allows you to find people who are having discussions along the lines of your business. In our case, we look to engage in discussions about Nevada travel. Or, simply find people who have traveled in Nevada and have an interesting story to share. For example, earlier this year I discovered an East Coast photographer named Bob Lussier, who had posted some spectacular photos from his Nevada travels on Google+. Two of his Austin photos from that trip were published in our July/August 2012 issue. How is your business a YOUtility? How do you help consumers via social media? How do you promote your content in creative ways? More importantly, how do you get people talking about it and sharing it?